Only the Sun, Venus, and the Moon are brighter than Jupiter. The planet is known as the fourth brightest object in the solar system. 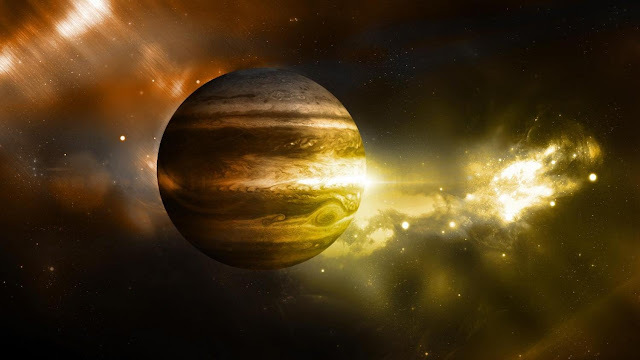 According to mythology, Jupiter was first discovered by the ancient Babylonians. This planet has the shortest day of all planets lasting about 9 hours and 55 minutes. Jupiter orbits the Sun once every 11,8 Earth years. The great red spot on planet Jupiter is so large that 3 Earths can fit inside it. 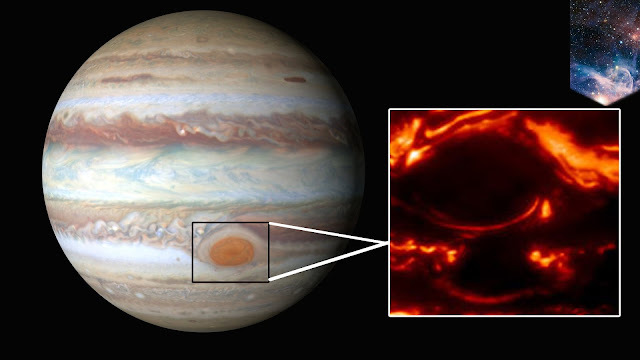 Jupiter’s interior is made out of metal, rock and hydrogen compounds. Below its massive atmosphere, there are layers of compressed gas, liquid metallic hydrogen, and a core of rock, metals, and ice. Ganymede, Jupiter’s moon, is the largest moon in our solar system. A total of eight spacecraft visited Jupiter and they are Pioneer 10 and 11, Galileo, Cassini, Voyager 1 and 2, Ulysses, and the New Horizons missions. The gravity on Jupiter is so strong that a rocket would have to speed at about 135 000 mph in order to leave the planet. The magnetosphere of Jupiter is the biggest in the solar system and about 20 times stronger than Earth’s. The Great Red Spot on Jupiter is actually a swirling storm that has raged for at least the last 150 years. The estimated temperature of Jupiter’s core is about 23871-degree Celsius. It is confirmed that Jupiter has the most moons of any planet at 67 moons.